Subscribe to our newsletter & receive a free six-ingredient smoothie e-book! Sign up! Cheesy pasta recipe … edition 10,000! That number may be a slight exaggeration, but still. I just can’t help myself. I’ve been waiting patiently (<— not so much) for an acceptable amount of time to pass since the super fun lasagna from back in December. And I’ve decided that today’s the day. 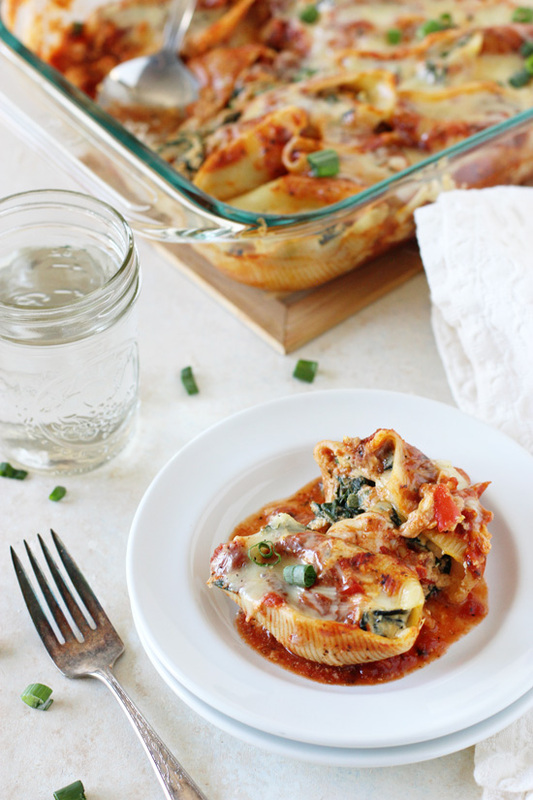 It’s time to share these sweet potato and kale stuffed shells! Apparently a little over one month is my limit. As you may already be able to tell, I have become utterly and completely obsessed with using sweet potato puree in pasta dishes. Especially ones that typically use ricotta cheese. For quite some time now, I’ve been subbing in the puree for a portion of the ricotta … and I tell you, it’s just magical. A little more veggie goodness and this awesome extra layer of flavor. Positive vibes all around! And for today’s dish we are doing just that once again. Plus adding in plenty of kale for some green and some diced red pepper, well, just because I like red bell pepper. The creamy, dreamy filling gets scooped into some jumbo pasta shells and off the dish goes to bake in the oven to get all bubbly and cheesy and fantastic. Tips & Tricks for Sweet Potato and Kale Stuffed Shells! – These shells are a great make-ahead dish! Assemble the dish completely then cover with aluminum foil as directed. Keep in the fridge until you are ready to enjoy. I like to take the dish out and give it plenty of time to come back to room temp before baking (this way you don’t have to allow extra time in the oven to get it heated all the way through). 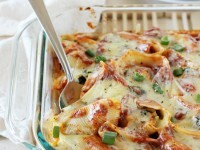 – When cooking the jumbo pasta shells, add a few extra to the water. This way you have extra in case any break when you are stuffing them with the filling. – And about that filling. This is a recent light bulb moment on my part … use a small cookie scoop to fill the shells! It makes it so easy and you’ll get an equal amount in all of the shells. Cheesy pasta … it’s just the best. Oh yes indeed! Flavorful, cheesy sweet potato and kale stuffed shells – a great make-ahead recipe! Filled with sweet potato, kale and red pepper! Bring a large pot of lightly salted water to a boil. Cook the pasta shells until al dente, according to the package directions (err on the side of undercooked – you do not want to overcook these). Drain then rinse well with cold water. Meanwhile, add the olive oil to a large skillet set over medium heat. When hot, add in the pepper and cook for about 2 to 3 minutes, until softened. Add in the garlic and cook for about 30 seconds, until fragrant. Add in the kale and vegetable broth. Cook, stirring occasionally, for about 6 to 8 minutes, until the kale has wilted down and the broth has evaporated. Remove from the heat and add to a large bowl. Add the ricotta, sweet potato puree, green onions, salt and pepper to the bowl and mix until combined. Taste and season with additional salt / pepper if needed. Mix in the egg (the mixture will be on the wet side). Spread about 1 ½ cups of the marinara sauce in the bottom of a 9×13 inch baking dish. Scoop an equal amount of the filling into each of the cooked pasta shells, working carefully so they don’t tear. Place the filled shells in the prepared baking dish in a single layer. Pour the remaining marinara sauce evenly over the top, then sprinkle with the cheese. Cover with aluminum foil. Bake for 30 minutes. Remove the foil and bake for an additional 10 minutes, until the cheese is melted and bubbly. Let stand for about 5 to 10 minutes. 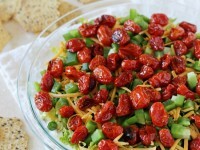 Garnish with additional sliced green onions and serve! One of the times I made this recipe, I used some regular mozzarella and some smoked mozzarella for the cheese. It’s completely delicious that way too! 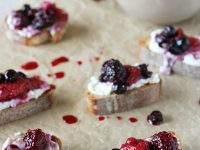 Subscribe to our NewsletterNever miss a recipe! Join the community & receive a free six-ingredient smoothie e-book! What is lacinato kale, I thought kale was kale. Hey Jackie! It’s a type of kale (also known as dinosaur kale!). It’s personally my favorite … I find it more tender and delicate than regular curly kale. But regular kale also will work just fine here! What brand of marinara sauce did you use in this recipe. Hey Jackie! I’ve used the Trader Joes brand, the Whole Foods 365 brand and the Harris Teeter house brand (I rotate between those three stores!). haha, I do the same thing where I make a bunch of similar recipes and then am scared to post them close to each other! I can totally see why you are all about the cheesy pasta recipes though! As much as I eat sweet potato, I’ve never added it to my pasta for some reason. That sounds like the best idea ever! I’m glad I’m not alone!!! haha thanks Izzy!! I really want to make this recipe, but I can’t find these Jumbo Shells anywhere in the UK. I was wondering if I could make the recipe some other way? Cheesy pasta is the best! My husband was just asking about using sweet potatoes in a pasta dish last night! I know what we’ll be eating this weekend! Happy Friday! You can never have too many pasta recipes on your blog!!!! Especially when they look as great as this one! 😉 Gotta love sweet-potato everything! Stuffed shells have been on my mind lately! I bought a box of shells that have been staring at me from the pantry. With kale growing on the roof this is the perfect recipe! Thanks lady! 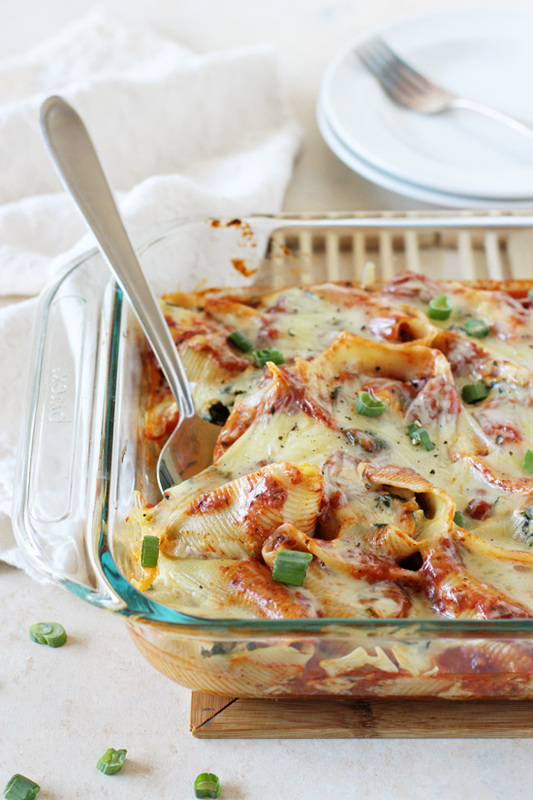 Giiirl, cheesy stuffed shells are the jam and these ones are beyond jam-tastic! Love that sweet potato puree and the kale! Plus I’m with you on red peppers being amazing! 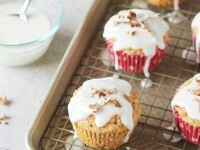 I could eat the whole baking pan of these beauties! Keep the cheesy lovin’ coming!! Pinned! Cheers, sweets! Thank goodness you can’t wait longer than a month to share cheesy deliciousness! Great idea to add sweet potato and to use the scoop! Two of my favorite things stuffed into shells?! Yes!! UGH, YES…cheese is my weakness too. I just can’t quit it! I love the sound of subbing the sweet potato for the ricotta and that you put kale in there too. 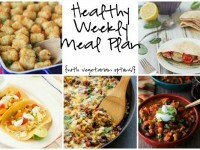 It’s a meal that would please everyone while still sneaking in some healthy veggies! I’m sitting here at almost 11:30 in the night and totally drooling over this dish right now. I’m cheese obsessed, I can’t lie. I tried to make a walnut basil pesto without cheese and it tasted really great…but my brain was like “I.Need.Cheese”. I went and added cheese ha! This look incredible and I love the use of the sweet potato puree. I truly missed your blog!! LOVE the rebrand!!! I totally agree!! Thanks Emma! I love stuffed shells! They are the ultimate comfort food! It is always time for cheesy pasta! This looks so good! I have used butternut a few times with pasta but never sweet potato, so I really need to try this! Pinning! Who CAN help themselves when it comes to cheesy pasta?? Not I. Looks phenomenal. 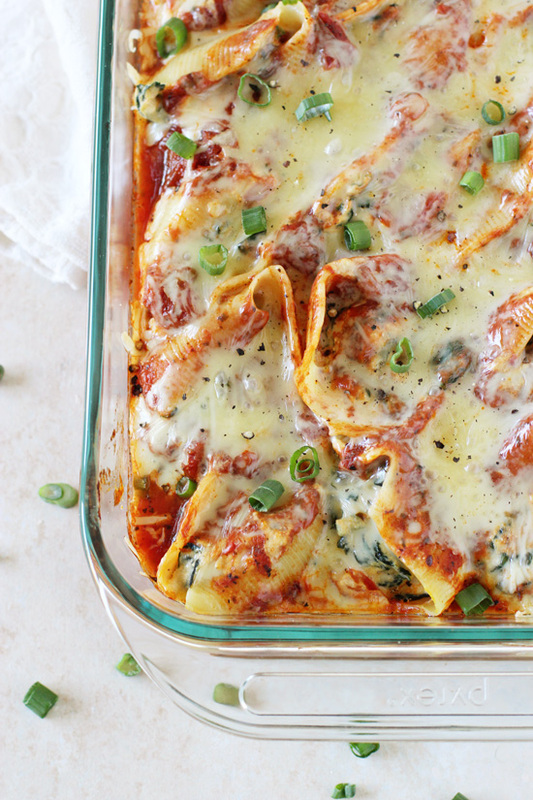 These stuffed shells look so delicious! You can never go wrong with pasta dishes! I think waiting a whole month was pretty impressive! And sweet potato and kale sounds like an awesome combo! I love that you squeezed in some extra veggie goodness by subbing in some sweet potato puree for some of the ricotta ! This is one fantastic dish and you bet I wouldn’t mind seeing this more than once a month! Haha I think one month is a more than acceptable amount of time since your last comforting pasta dish…..that’s longer than I could wait 🙂 Oh man, these stuffed shells look and sound incredible! Love the sweet potato puree and kale! haha I tried to wait longer but just couldn’t do it 😉 Thanks Kelly!! This looks amazing for a cheesy dinner treat! If I could pop over to your place to um, sample this, I totally would. I’ll send you my address for shipping purposes. Just kidding! I’m loving all that cheese on top, I have to be honest. And I’m with you on the red bell pepper. I absolutely love them. They are the best tasting things on earth and so good for you. I love your cheesy casseroles, they always present so well. lol I don’t think they’d ship too well!!! That’s a great way to eat some more kale 🙂 This cheesy yummy goodness looks amazing! Pasta, sweet potatoes and oozing melted cheese – what can be better that that? Sweet potato makes everything better! These shells look phenomenal! Gosh..that looks too good to miss in life! Pass the spoon over pleeeeeeeeeeeeeeeeease! 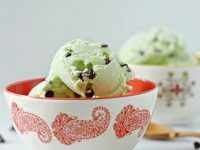 This look so appealing and delicious, Ashely. Absolutely love the stuffing of kale and sweet potatoes! And also love how easy they are to prepare! Cheers! I don’t think that you can ever have too many cheesy pasta dishes can you? Especially when they have kale in them, as that means they are super healthy. This looks insanely good and proper comfort food. I’m a recipe developer and integrative health coach for women & creative entrepreneurs. This site is a reflection of both my passions. Cooking with real, whole foods in a way that is simple and irresistibly delicious, and working with clients 1-on-1 to make changes in their health to maximize joy and thrive. ©2019 Cook Nourish Bliss. Design by Purr.